When the FedEx truck pulled up to my house late yesterday morning I was PUMPED. I knew it was the skein of yarn I needed to finish my Shalom cardigan, which I wasn’t expecting to arrive until Monday. With two and a half days left of the Olympics, I was positive I could knit two sleeves in that time. I was going to do it even if I had to stay up all night to finish. The three skeins of MadelineTosh Rustication I used were very well matched – so much so that I didn’t have to alternate skeins, a rarity when knitting with handpainted yarn. Sadly, this wasn’t the case with the final skein. 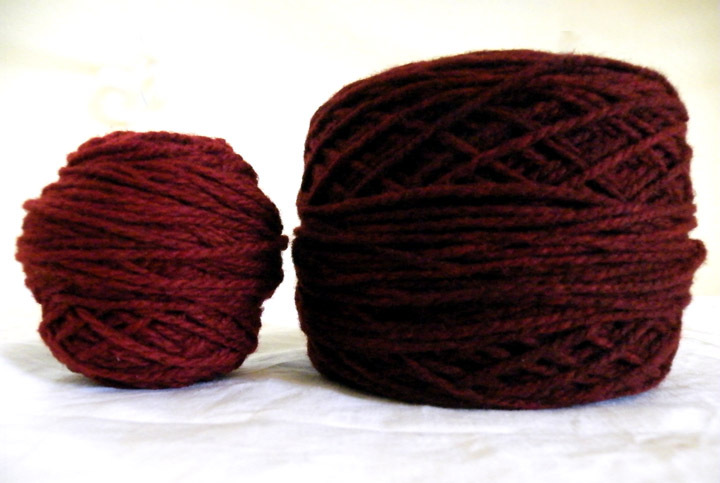 The leftovers from my sweater are on the left, and the new skein is on the right. And as you can see, it’s much darker. I thought maybe I could alternate skeins, but the difference is enough that the fabric came out striped. I suppose I could have knit the sleeves out of the darker color, and although it would have been noticeable it probably wouldn’t be as bad as I imagined. But the color difference would have bothered me every time I wore it, so I did the only thing I could: I knit a couple rows of garter stitch on each sleeve and bound off. My Shalom will be sleeveless. And it’s OK. Really. I tried it on, and it’s super cute, and I already love it. Shalom is soaking and will be blocked today, as will my Tea Leaves cardigan. Expect finished pictures of both, plus my Leisl, in the next week. Two cardigans in two weeks. I never would have thought I could do it. When you set your mind (or your fingers) to something there is no stopping you! If you don’t believe me go look in the mirror. Good for you honey – can’t wait for the pictures. Sleeves or no sleeves, I am officially impressed. Looking forward to the pictures! You managed it although you had problems with the material. Great !!!! Can`t wait to see the pictures.